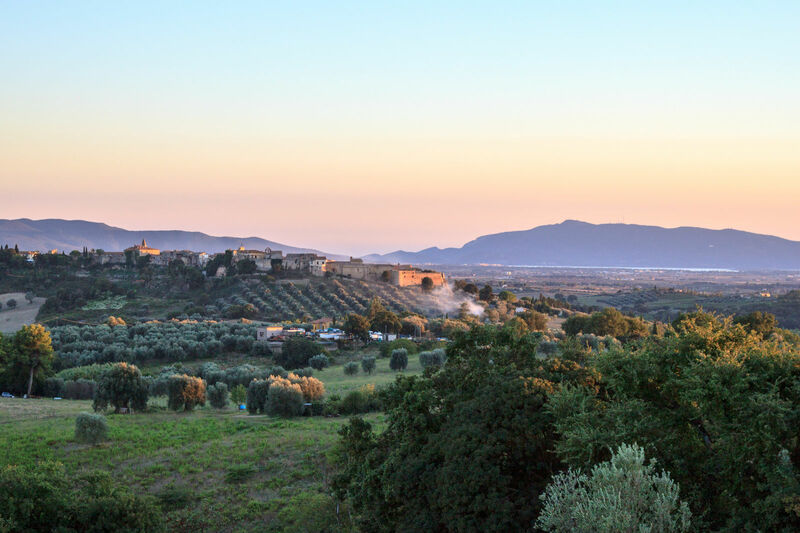 The town of Magliano in Toscana has a pleasing medieval aspect, and you find it on the top of a hill cultivated with vines and olive trees, right in the middle of the Grosseto Maremma, whose natural park does in fact extend into the town's municipal territory. Archaeological digs carried out in this area have unearthed a number of necropolises, explained by the fact that Magliano was an Etruscan settlement before it became the ancient Roman town of Heba. From the 9th century the town remained firmly in the hands of the Aldobrandeschi counts until becoming the property of the Republic of Siena, which fortified it with a magnificent ring of walls, well preserved even today, encircling the ancient town centre. Certain churches in the area are notable for their architectural plainness, such as San Giovanni Battista and the Parish Church of San Martino. Two splendid fortified towns date back to the same period, those of Montiano and Pereta. The second is particularly noteworthy for its little houses, all tightly packed together and often connected by supporting arches. Apart from its appearances in art history, Magliano is famous for its important hand in viticulture, helping to produce the D.O.C. Morellino di Scansano wine.